Happy Sunday!!! 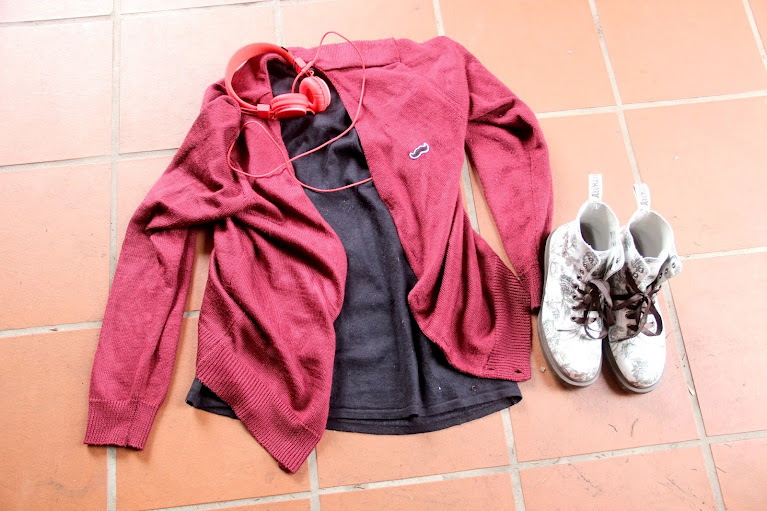 After a copious amount of tutoring, I am home and ready to share with you guys my Winter Clothing Essentials! I know that Winter will be over in less than 20 days but hey! Who cares? It will be Winter soon enough for my lovely friends in the northern atmosphere. The essentials will be shown through two outfits and I'm sorry that I'm not wearing the outfits as I have been pimply and also it's a lazy Sunday. But you're right though, I am going to tutoring on a Sunday and I'm not willing to change into outfits. Yeah, that seems about right. Enjoy :) x.
Alice In The Eve Skater Dress from General Pants about two years ago. Skater dresses have been really popular recently. They are so flattering on and I am attracted to the high neckline since my ... bosoms are not exactly the biggest so there's no point in showing some non-existent cleavage. Wool skater dresses are well suited to the Winter as it keeps you so warm and it doesn't look too different from a normal skater dress. Definitely a must have! Toddland Mustache Cardigan in Maroon (buy here) Before anyone start criticising me, yes. I am aware that this is a men's cardigan but how can anyone resist a moustache on a cardigan? I came across this cardigan on Urban Outfitters and it was love at first sight. Some my say I have a slight fetish for moustaches so this is the perfect cardigan for me! It is oversized, incredibly warm and can brighten up any dull Winter's Day! Being a smart one, I have forgotten to photograph tights with this outfit but any from here will be fine. Tights are perfect for keeping the bare legs warm in the Winter. They come in a range of patterns, colours and textures so there's one pair suitable for everyone! If this outfit didn't have the bright red cardigan, a simple coloured pair of tights can mesh the outfit together and you'll definitely stand out in a crowd. They don't sell my exact pair anymore but this pair is similar. Let's get straight to the point: everyone needs a pair of Docs. Everyone. Not just any old military style boots but Dr. Martens Boots. They are amazing. I wear these shoes one out of three times I go out (the other times I wear my bright pink Docs. Duh.). They go with almost every outfit, and if they don't I alter the outfit so that they match my Docs. Super comfortable and heavy duty aswel! Quite pricy, I must admit but they are definitely worth the investment. URBANEARS Headphones in Red (buy here) These are not really an clothing "essential" but hey, it brought my outfit together aswel. These are a more affordable, stylish take on headphones and they're good enough for me. I decided to get the red ones because they didn't sell the berry ones I wanted and red was the most similar colour. Headphones are definitely the new earphones and they keep my ears warm so why not? This was found in my mother's wardrobe and you can't really tell in this photo but the shirt actually has a subtle polka dot print. Long sleeve shirts are the saviours of Winter. They are perfect for layering and can be easily concealed if a sweater or button up shirt was worn over it. They keep you so warm and some styles can actually be really flattering. They can also match with any outfit because hello? they're basics! Don't really remember where this cardigan was from but you can buy it from almost anywhere. I apologise for featuring another cardigan in place of a jumper/sweatshirt but I couldn't find my basic black sweatshirt and I panicked so this will do. Jumpers are my favourite item of clothing in winter because I usually wear about three to five layers of clothing underneath my jumper but no one will see it :). I may look a bit more bulky but usually, they do a pretty good job in covering it up! Pink Trousers from Zara. I occasionally wear dresses in the winter because of the heavy winds that may give me a unwanted Marilyn Monroe effect so pants all the way! I usually wear jeans but recently, I've began to gravitate towards chinos thanks to my brother. The rigidness of jeans make them super uncomfortable to wear (for me anyway) so chinos work really well as they are so comfortable and flexible. To perk up my outfit, I tend to wear brighter coloured chinos so that it will add some colour to my outfit. Brogues from Zara Hong Kong so I don't know if they can be purchased down under. Sorry :(. Brogues are definitely my second shoe of choice, apart from my Docs. They are super comfortable (as you can see 99.99% of the clothing I wear must be comfortable or I'll refuse to wear it) and these stylish glitter and leopard print brogues are definitely a classic pair of shoes that would stay in my shoe collection for years to come or until the wear out. Rayban Original Wayfarers. These babies have been in my life for a bit over two years now. I wear them almost everyday as I am short sighted and need them to see. I did went through a phase where I would wear contacts but glasses were just so hassle free. Everyone now recognises me as "the girl with the funky glasses" and I don't really mind that title as I am an individual and these glasses rule! What are your Winter Essentials? Leave me some of your favourite items in the comments below because I am curious to find out what you guys like to wear. There's a GIVEAWAY on my blog: http://www.acupofashion.com/2012/08/sodini-giveaway.html I'm waiting for you!